I had (briefly) mentioned that my brother-in-law was going to have a baby this spring. I figured with a shower coming up soon, I had better get started planning on what I was going to make. Up first? 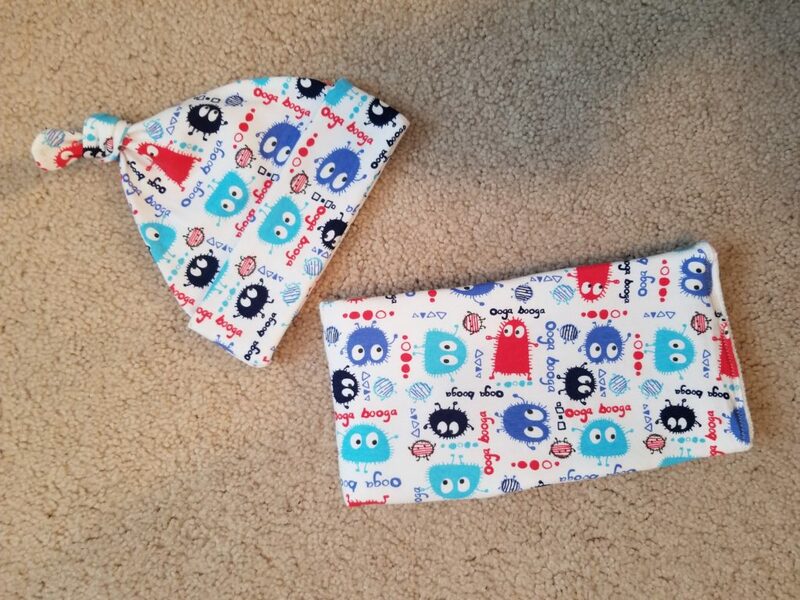 A knotted hat and matching burp cloth. When I went through my stash earlier this month, I had pulled several fabrics that I thought might make fun baby gifts. My first selection was a “hipster baby” print… then after looking at it, realized it probably doesn’t fit my brother-in-law’s style very well (he’s pretty anti-hipster and prefers to identify himself with the punk subculture), so I moved onto a white, tonal giraffe print. After starting to cut and work with this fabric for awhile, I scrapped it as well (it was in a knit bundle) because it was just too thin (and sheer… that’s not going to hold up in baby wear). Lastly I pulled out my final option, the Ooga Booga print. I had always loved this print (also from a knit bundle), but never found the right project for it… until now. So, I set out to make the Top Knot hat from Pretty Prudent and a matching burp cloth. While the hat turned out great, I don’t really recommend making a decorative strip in knit for a burp rag (cloth diaper) as it just doesn’t behave very well. I had also planned on making a coordinating blanket, but the fabric I selected clashed terribly. I am trying to make this print look a bit more feminine\gender neutral, and in doing so, I picked a flannel backing that had too much pink in it. While the other colors matched well, that pink looked horrible with the red on the front. So, it’s back to the drawing board on what to use on that front. This entry was posted in Uncategorized on January 29, 2019 by stacy.